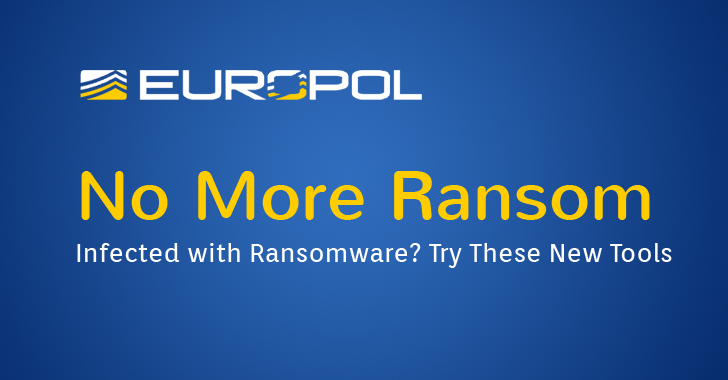 Europol announced today the initiative, dubbed NO More Ransom, that has been backed by technology giant Intel, cyber security firm Kaspersky Lab and the Netherlands police, aiming at decreasing an "exponential" rise in Ransomware threat. Ransomware is a piece of malware that typically locks victim's device using encryption and demands a fee to decrypt the important data. The estimated number of ransomware victims tripled in the first quarter of this year alone. "For a few years now ransomware has become a dominant concern for EU law enforcement," said Europol's deputy director Wil van Gemert. "We expect to help many people to recover control over their files, while raising awareness and educating the population on how to maintain their devices clean from malware." This No More Ransom initiative informs the public about the dangers of ransomware threat, how to avoid falling victim to it and how to recover data without paying money to cyber-criminals if a person or company falls for one. The new No More Ransom online portal provides users with downloadable tools that may help decrypt computers affected by ransomware attacks. In its initial stage, NoMoreRansom.org contains four decryption tools for ransomware, including the notorious CryptXXX and the CoinVault and Bitcryptor families. "We can only change the situation if we coordinate our efforts to fight against ransomware," said Jornt van der Wiel, security researcher at Kaspersky. The portal also provides a "Crytpo Sherrif" section that allows people to upload more ransomware malware samples and a description to identify the type of ransomware threat affecting a system. We saw an enormous rise in Ransomware, both in numbers and sophistication. The latest version of Cerber ransomware is so sophisticated that it generates a different sample in every 15 seconds to bypass signature-based antivirus software. One of the best advice to keep yourself safe from this emerging threat, is to backup all your important data regularly. Don't pay criminals the ransom, as it motivates them to keep on infecting a large number of people. Some organizations have paid cyber criminal's demands, including the University of Calgary in Alberta, which paid $20,000 ransom to decrypt its computer systems' files and restore access to its own email system after getting hit by a ransomware infection. In addition, you are always advised to keep your software up-to-date, use a reputed antivirus solution, and trust no one while opening any email or message attachments.